A Brand New Arby’s is Coming to Sparta, WI! The Sparta, WI Arby’s is set to open November 28th and we can’t wait to serve you! Join us for our Grand Opening December 6-9 for fun, prizes and deals! Grand Reopening Celebration at 4270 Milltown Road in Green Bay! 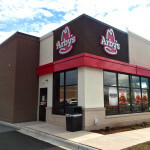 DRM’S NEWEST GREEN BAY ARBY’S LOCATION IS NOW OPEN!! The new Arby’s location at 1911 Main Street in Green Bay Wisconsin is now open! After a week long Grand Opening Celebration, the store is ready to serve you! On October 8, 1,600 residents of Green Bay stopped in for their FREE sandwich and to check out the new location. 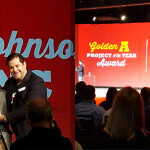 ARBY’S 2016 WORLDWIDE FRANCHISE CONVENTION- CONGRATS DRM! Congratulations to DRM for winning the Golden A award at the convention! This year’s Convention was attended by more than 1,100 participants, which makes it the largest and most attended Convention ever. The convention had 400 franchisees in attendance from 160 franchise organizations. Today Arby’s released their first first Corporate Social Responsibility (CSR) Report. The report shares progress and stories from across the Arby’s PurposeFULL® CSR platform and its four pillars: YouthFULL®, SkillFULL®, ResourceFULL® and FlavorFULL®. June 3, 2016 – Omaha, NE – DRM appoints Nick Murray as the Restaurant Construction & Remodeling Project Manager. March 15, 2016 –OMAHA — Arby’s Restaurant Group, Inc. (ARG), parent company of the franchisor of the Arby’s brand, has announced the signing of several recent franchise development agreements beginning late Q4 2015 through today, for the development of 138 new restaurants. NEW! ROCKFORD ARBY’S® NOW OPEN! Rockford, IL – Arby’s newest Rockford restaurant, on 241 N. Phelps Ave., is open and ready to serve you! Open 10am – 11pm, seven days a week. NEW! ONALASKA, WI ARBY’S® NOW OPEN!! Onalaska, WI – Arby’s is open and ready to serve you, 10am – Midnight. A big thank you to the community of Onalaska, La Crosse and surrounding areas!! We had a great opening week celebrating with you! ARBY’S CLUB 50, GRAND RE-OPENING EVENT! Urbandale, IA – Stop in to see our newly remodeled Arby’s restaurant on 100th St. in Urbandale, IA! Only one week later in the same area, round 2 of the Club 50 promotion was a great success! Thanks for coming out to celebrate with us!